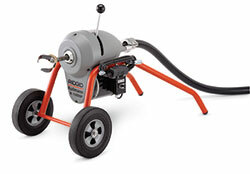 Use Ridgid Sectional Machines for cleaning drain and sewer lines. These operator-friendly units use sectional-type cable and feature a quick-change coupling system for connecting tools easily. Feed cable manually in and out of the machine in forward or reverse mode. The cable stops when you release the handle‚ maximizing your control. 115V electric-induction motors draw a max of 10.4 amps. K-1500B Sectional Machines offer increased horsepower over the K-60SP and clean longer distances—up to 300 feet! Includes: 105’ of 1-1/4" C-11 cable‚ (2) A-8 cable carriers‚ A-1 mitt and a 9-piece tool set. Tool set includes: straight auger‚ funnel auger‚ retrieving auger‚ spade cutter‚ sharktooth cutter‚ sawtooth cutter‚ two hex keys and toolbox. Dimensions: 40-5/8" x 20-3/4" x 27-3/4"